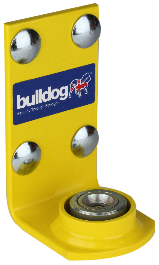 The Bulldog GD400 Garage Door Lock will fit inside or outside most metal, glass fibre, plastic or wooden garage doors. Comes complete with angle bracket back plate & ground tube, all fasteners and Bulldog Super Lock Bolt. Bolt on ‘L’ shaped bracket to fit either outside or inside of a garage door. Reinforcing plate supplied in kit to strengthen door (75 mm x 110 mm, 6 mm thick). M10 x 75 mm coach bolts supplied for fitting to metal or wooden doors. Lock tube fits flush with ground, no protruding parts. When locked, the garage door is physically held to the ground making prising of the door very difficult. Dust caps provided to prevent dirt and dust ingress into lock and lock tube. Finished in highly visible yellow powder coating.